Friday, Sept. 27 - 3-D Printing: Economic Development, Regulatory and other Public Policy Issues, sponsored and moderated by Assemblywoman Linda B. Rosenthal, Chair of the New York State Assembly Legislative Commission on Science and Technology. job generation in our City and State. We’ve scheduled our Roundtable events from Monday, 23 September to Friday, 27 September. This is the week following the very-popular—and family-friendly—World Maker Faire at the NYSCI Hall of Science in Flushing Meadows, Queens, on the weekend of 21 and 22 September. Please note that I’m speaking at the Faire—my presentation is entitled Come (3DP) Cluster—on Saturday, 21 September, at 11:30 AM on the “Make: 3D Printing Stage.” My talk will be about envisioning and establishing a 3DP industrial-segment “cluster”—or a commercial ecosystem built around Additive Manufacturing—in Metro New York. And, we’d like to thank our original Founding Sponsor of NY3DP Summits—Sara Garretson and ITAC—for encouragement, partner introductions and guidance. ITAC is the New York City Center for the National Institute of Standards (NIST) Manufacturing Extension Partnership (MEP), a federal program dedicated to reinvigorating US manufacturing. As one of ten designated Regional Technology Development Centers (RTDCs) within New York State, ITAC helps to grow manufacturing and technology companies in New York City. For over 25 years, ITAC has been delivering technical assistance, and training and services to industrial and manufacturing firms in New York City. In the last five years, ITAC’s clients have reported to an independent evaluation firm that our services have created and retained 4,800 jobs and generated $1.1 billion in business and economic impacts. Our 3DP-driven, DIY citizen-Makers are leading our governments’ economic-development policy makers. NYC3DP.com & This Week in NYC3DP Publisher will present his insightful perspective on the development of NYC’s 3DP, world-beating cluster. These novel views stem from reporting on bottom-up, DIY Makers, key 3DP product/services companies, tech startups, public officials, economic development players, educators, non-profits, foundations, et al. We citizens of New York need to foster our Nation’s biggest & best re-industrialization HERE. With its hand-made tech empowerment, 3DP will drive our City’s manufacturing makeover. 3DPers, Join In! Location: on the “Make: 3D Printing Stage,” NYSCI, New York Hall of Science, 47-01 111th Street, Flushing Meadows, Queens. More detailed information for this session can be found on our Site by clicking HERE and on the World Maker Faire site HERE. This first NY3DP Summits session kicks off our week of roundtables—in support of 3DP in our City and State—by focusing on local economic development. Bottom/bottom 3DP line: can our engines of Confab’ing and Clustering help drive Job Creation via Additive Manufacturing in the neighborhood? With the distributed power of disruptive (and opportunity-presenting!) 3DP, the hyperlocal is where the action is. The local Economic Development Organization (EDO: think BID or Merchant Block) is now empowered to help re-industrialize the Nabes—kitchen table by walk-up by storefront. This Roundtable will examine such novel concepts as how to enable EDOs—local, Borough-based and/or City-wide—to employ, educate around and deploy 3DP knowledge, how-to and implementable strategy/tactics to 3DP empower their community constituents. How might the new workforce of “Techcreatives”—the Digital Yeomanry of Sci/Art—help infuse local communities with commercializing 3DP? Can we expand our City talent pool with STE(A)M (Science, Technology, Engineering, Art/Design, Math) education at every level? The Roundtable will consider the business leverage of Curious Benchmates—found in such local phenomena as the blend of handmade Etsy-esque and organic 3DP and New Lab “re-artisan’ing” via rapid prototyping and short-run production on ultra-tech laser-sintering 3D printers. Conferees will confer on how 3DP might supercharge the Brooklyn core commercial competencies of Furniture, Fashion and Food. The Roundtable will consider how new and vibrant Public/Private Partnerships for collaboration and advocacy can support our new urban (re)industrialization. Think Pratt Center’s (Adam Friedman!) Urban Manufacturing Alliance and “Made In NYC” initiative. Or, New Lab’s imminent expansion into the now a-building creative spaces of the Green Manufacturing Center at the Brooklyn Navy Yard’s BLDG 128. Finally, how can hyper-local 3DP integration with small business and community economic development help drive our Gotham industrial-segment “cluster-ization”—and assist NYC to build the world’s premier Additive Manufacturing Cluster? Time: 5pm to 9pm (click HERE for detailed agenda). Location: DUMBO Startup Lab, Suite 718, 68 Jay Street (corner of Front Street), DUMBO, Brooklyn, NY. Will New York City Spearhead America’s Manufacturing Make-Over Via Home-Grown, Disruptive 3DP Tech? Additive Manufacturing—much better known by its common title “3D Printing” (3DP: our usage)—has been lauded as THE engine of the Third or even Fourth Industrial Revolution. Regardless of the classification hype, 3DP has been a “revolution” in the making for the last 30 years. Now—driven by the 3DP version of Moore’s Law—Additive Manufacturing finally threatens to become a truly disruptive technology. (This would be—accurately—the Fourth Digital Disruptor in the last 40 years: PC->Internet->Social Media->3DP.) Revolution or Disruptor, the expert—and diverse—participants on our “New Industrial Revolution…” Roundtable will investigate the questions (and more) posed in our Roundtable subtitle. Will 3DP help propel an American manufacturing “make-over?” Will our City-fostered 3DP players help drive this change? And/or, will New York City (and State) grasp a commercially commanding, world-leading position as THE 3DP Cluster—or industrial-segment Ecosystem—for the betterment of our commonweal interests? This event presents a “suite” of activities, including a Roundtable Session, a Mini-3DP demonstration, a Walking Tour and a Reception. Educators have to make demanding choices about which tools and technologies to use in the classroom. With the advent of 3D printing, teachers have difficult and interesting decisions to make. How and why should students use 3DP? What does 3DP teach kids? How does 3DP instruct? How does this type of new curriculum prepare students for the future? How will the educator first understand novel and wonkish 3DP? And, then mesh 3DP with instructive know-how, class administration and inter-personal connecting with students? Goals of our expert-driven Roundtable discussions include 3DP-based strategies for: teaching the teacher; teaching how-to teach and curriculum building; provisioning an online knowledge base; networking to other appropriate schools and organizations; obtaining administration buy-in; promoting a school’s PR and profile; and employing 3DP-created visual aids, hands-on learning and interactive class work. For more detailed information about this session, click HERE. This semi-annual event, curated by Peter Verkooijen, is an industry-insider event structured around the topic “Creating a Leaner Decentralized Manufacturing Ecosystem.” Key speakers include individuals from design, engineering, manufacturing and 3DP. 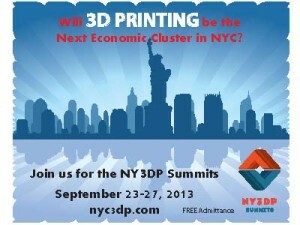 More details and separate registration (NOT a NY3DP Summits-coordinated event) can be found at http://dfmsummit.com/. This roundtable session is presented by Linda B. Rosenthal, Chair of the New York State Assembly Legislative Commission on Science and Technology. The purpose is to examine the impact of the growth of 3-D printing and consider what policies may be needed to encourage development and use of the technology while protecting consumers in New York City and State. To volunteer for NY3DP Summits, click HERE. To exhibit at one of our Mini-Expos, click HERE.